This past summer I read fashion blogs like crazy. I straight up spent eight hours one day looking at blogs. That's cray. And I just so happened to stumble upon some book recommendations by some of my style icons. Since my icons recommended them, I bought them like any star-crazed fan would. 1. Take Ivy. This book chronicles a Japanese photographer and three Japanese authors journey through the Ivy League universities. It is revered as one of the most influential books on style. Originally published in Japan in 1965, Take Ivy sparked an influx of people imitating American "Ivy Style" in Japan. Essentially, a fashion bible for those of us that favor a prep aesthetic (like me). And if you're a big baller, shot caller, pick up the updated version, Take 8 Ivy, for a cool fifty bucks. 2. The Sartorialist. If you need an explanation for this, then you need to reevaluate your life. I'm kidding. I'm not that much of a buttface... Seriously, I'm not. Okay, on to more relevant topics. 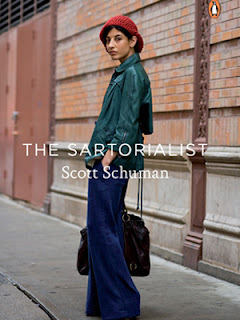 About two years ago, Scott Schuman of The Sartorialist (the blog that book inspired) compiled some of the most sartorially striking photographs along with commentary to create a book that can inspire anyone. Schuman's blog is the one that really got me hooked on fashion; I have 72 of my favorite pics from his blog saved and on constant rotation as the background of my laptop. My love for him is real. Showcasing a wide range of styles, this may just be the fashion bible for anyone that loves, well, life. And I'm going to go ahead and guess that that's most of us. 3. Classy: Exceptional Advice for the Extremely Modern Lady. I'm not going to lie, I have referred to myself as "bro" once or twice (numerous times), and Derek Blasberg has made me rethink my ways. And yes, I know, there are many feminist arguments that can be said for and against this book, but it has some great advice in it. Like when it's okay to use foul language in reference to some skank (whoops) that accidentally stole your iPhone, and what "casual" and "white tie" really mean. It's useful stuff. Blasberg's voice really shines through and makes for a fun and informative read. And like Take Ivy, there is now an updated version with even more advice for young ladies, check it out. This is the fashion bible for anyone that thinks they need to do a little brushing up on basic manners. And manners matter. And I know you just added these books to your wish list. Ya know, since I'm your style icon and all.